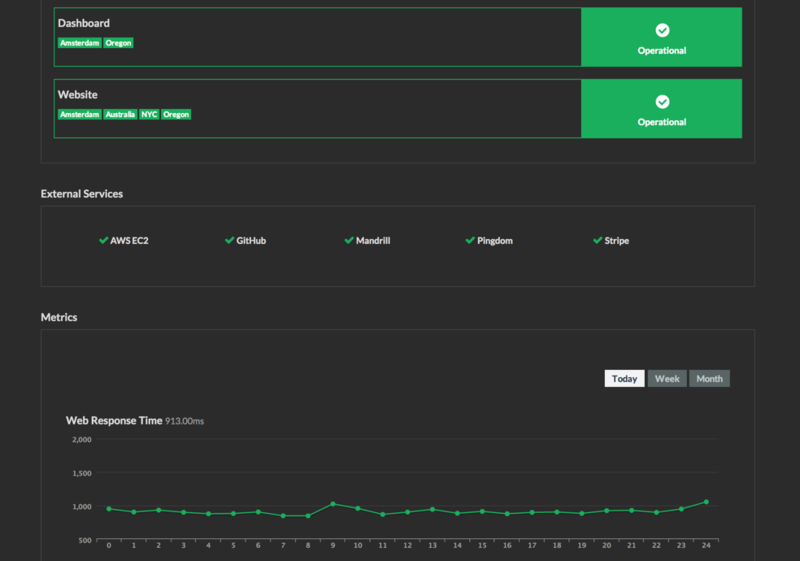 We just launched a surprise new feature… External service monitoring! Our robots are continuously monitoring the API endpoints of various 3rd party services. 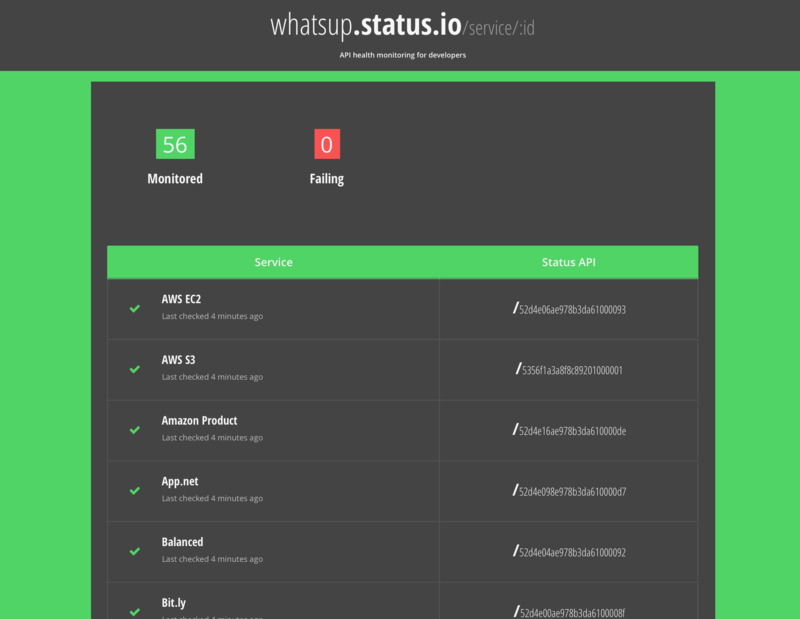 Over 50 services are already being monitored and you can see the whole list at whatsup.status.io. You can now select the appropriate services and include their current status directly on your status page. 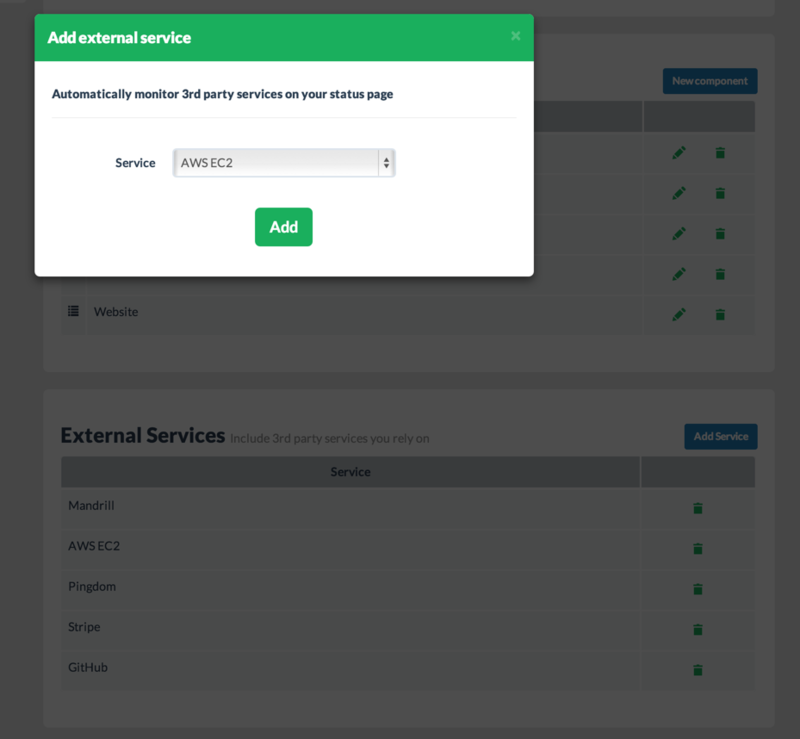 Add external services to your status page in the Dashboard. Simple go to the Components view and scroll to the bottom. Click the Add service button in the External services section. Feel free to add as many services as you wish. They will be sorted alphabetically on your status page. Stripe, Twilio, Mailchimp and Twitter are just some of the 50+ services we are monitoring already. Let us know what services we are missing. 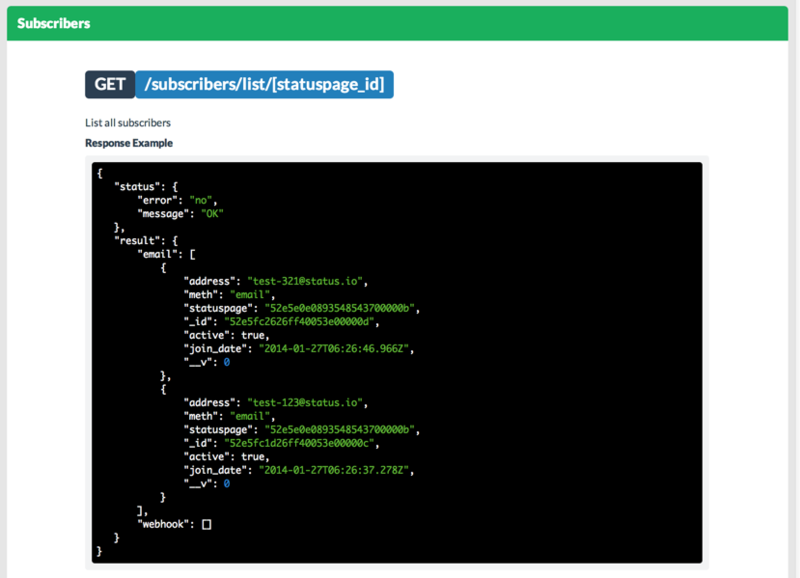 v1 of the Status.io API is fully baked and ready for consumption. The API includes the most critical functions for managing your status page. If you build a plugin, let us know! And look out for the custom metrics API, coming very soon! When using a custom domain, such as status.example.com, you must create a CNAME record pointing to domain.status.io. Now you may choose between the .io or .com TLD. TLD’s are each controlled by different entities, different infrastructure, etc. We all saw the .io TLD experience issues early in 2013. While we can’t prevent a TLD issue, we decided to offer multi-TLD’s so our customers can choose which TLD they wish to utilize. Status.io is powered by open source software and we have the utmost respect and love for the open source community. As of today we are offering sponsored accounts at Status.io for selected open source projects. To get started, sign up for a normal account. Then send us an email and let us know which open source project the status page is for. The health of 50+ services are being monitored, and we plan to add many more. 4 distributed nodes are monitoring the service availability of each API by inspecting the endpoint’s HTTP response and/or performing synthetic transactions, latter being the goal for all checks. Give it a try. It’s 100% free. Today’s update brings a slew of enhancements that we have been developing. To continue growing towards our vision, we decided to refactor some of Status.io’s core functionality. 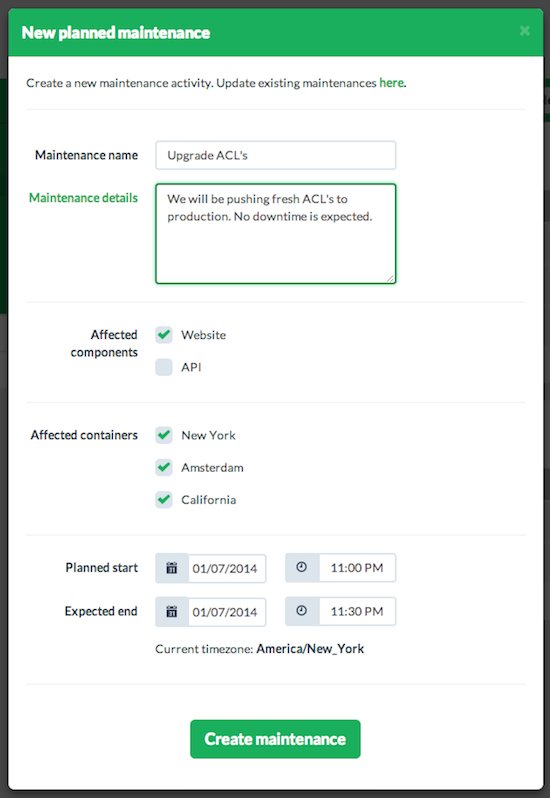 You will notice that components can now be associated with multiple-containers and status updates are now separated by incidents and planned maintenance. These changes were a large hurdle that we had to overcome before continuing to add new features. All existing status pages have been automatically upgraded to take advantage of these new enhancements. Support for multitenancy architecture has been baked into Status.io since day one using what we call containers. Containers are used to represent a single geographic location and/or data center. There were limitations originally since each component could only be linked to a single container. To get around this, we created duplicate components. As of today you can consolidate for components and remove those duplicates. Modify your existing components and select all of the appropriate containers. Schedule maintenance activities in advance. Your users will be able to see all upcoming events. 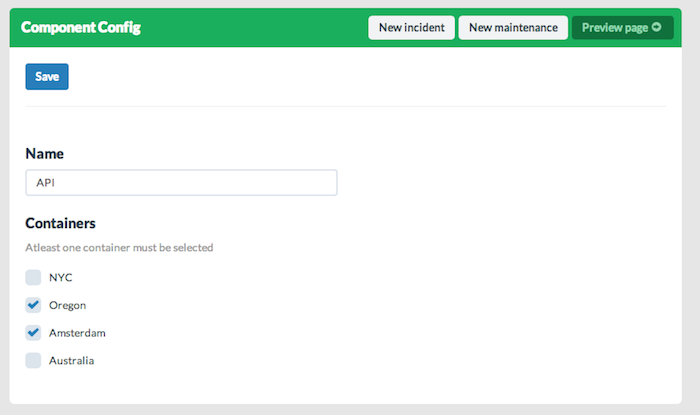 When you’re ready, start your maintenance and it will be displayed prominently on your status page. 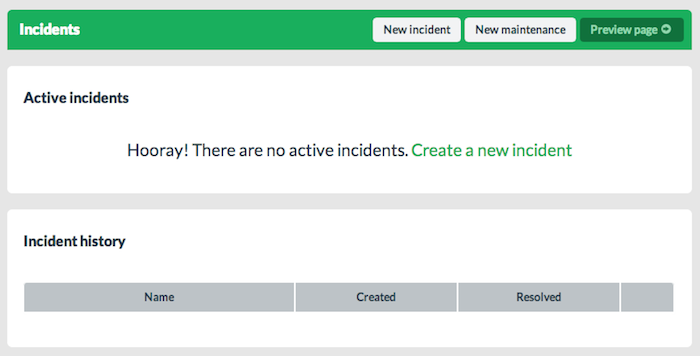 Create a new incident to post the initial status update during an outage or other system failure. Further updates will be linked to the original incident. You can even create multiple incidents at the same time and your users will be able to see which updates belong to each incident. Metrics thresholds – Control the min and max values for each metric graph on your status page. Theme-able status bar – Change the default color of the status bar using our theme designer. Fine tuned Pingdom automation – Pingdom alerts now trigger specific containers within each component. We launched our prototype at the end of July 2013 and have spent the past 6 months hacking on our product to deliver a solid platform for hosting your status page. Tons of great features are right around the corner, we deploy almost every day! Create your status page now.